Holly Fuller McLain grew up on her Pennsylvania farm without horses. As a child, she would look through old photo albums, finding pictures of her grandparents, who were true horsemen. After begging incessantly, at age eight, she finally got a horse. That one horse started a passion for horses and life long quest for knowledge in the art of horsemanship. Willow Brook Farms became famous for great performance Quarter Horses, sold around the world. C T Fuller, Holly’s father owned the iconic stallion, ”Joe Cody”. Both he and Joe are in the American Quarter Horse and the National Reining Horse Halls of Fame. Holly grew up riding, training, and showing World Champion Quarter Horses under the guidance of Bob Anthony, another Hall of Fame inductee. When she went to Bennett College, her classmates made fun of her little quarter horse and western saddle. She decided that the big thoroughbreds were horses, and she could master the change of disciplines. Holly took a job grooming for a well, known Hunter-Jumper Trainer, Carl Knee. Within a year, she had bought a young prospect for the show ring and was riding and showing horses for him and others. Holly rode and showed “Castle Walk”, to Champion at Madison Square Garden, Washington Int’l, Royal winter Fair, Toronto, and was AHSA-US Equestrian - 1st Year Green Working Hunter Horse of the Year in 1970. Holly showed at the Grand Prix Level her last year on the circuit. She and her good mare “Manon” were 3rd in the Speed Class at Chagrin, Ohio, against International competitors. Holly came to Aspen, Colorado in 1973 to ski that winter. As so many young people do, she never left. Her father partnered with her to buy raw land in 1974, which became Moon Run Ranch. 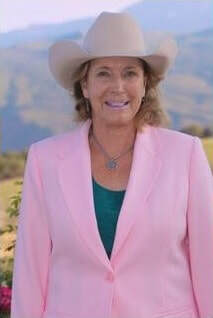 Holly owned and operated Moon Run Ranch as a horse boarding facility, an outfitting business for 18 yrs. with her husband Doug McLain; she taught the Aspen Camp School for the Deaf children’s riding program, hosted Aspen Flyfishing Guides in the Moon Run pond, and hosted special events for corporations and locals alike. She raised her two children, Travis & Afton at the ranch, where they all grew up together. After 40 years, Holly sold Moon Run Ranch and moved to a ten acres property above El Jebel, which she named Rumble Ridge. She now has a small boarding business, and specializes in equine rehabilitation for after surgery and hospice horses.